Wanting to have fun in the hot sun? Try one of our Waterslides, Dunk Tank, or the Sno-Kone machine to cool you down! Now introducing our new 18' Waterslide! Welcome to Midstate Jumpers! Whether you're looking for bounce house rentals in Central Oregon, water slide rentals in Central Oregon, or other great party rentals, we're sure to have what you're looking for! The Party Starts at Midstate Jumpers! At Midstate Jumpers, we know that finding the perfect party rental for your party is your main priority. That's why we're committed to providing Central Oregon, and other surrounding areas with the largest selection of inflatable party rentals. Whether you're looking to rent a jumper for a birthday party or a water slide for rent, we have what you're looking for! 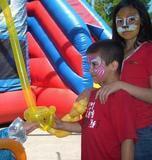 Planning the perfect birthday party with the right theme is extremely important. That's why we have several themes to choose from. Whether you would like to rent a Disney Princess bounce house for your little princess, or looking to rock with Hannah Montana, we have the theme that's right for you. 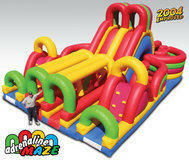 Of course, for the action packed maniacs, we also rent Batman bounce houses and Disney Car's bounce houses. We have something for everyone! Toddlers go crazy for our Dora the Explorer bounce house. Of course, spring is here again. Before you know it, it will be perfect weather for water slide rentals. We have great slides that will provide you and your guests with hours of heat-beating-water-soaking fun! If you're looking for a water slide for rent in Bend, we've got you covered! If you're planning a large event, and looking to rent a dunk tank, inflatable slide, or other forms of entertainment such as face painting and balloon animals, we have that too! We cater to parties of all shapes and sizes. Whether you're planning a birthday party, church or school event, graduation party, corporate event, or any other type of special event, we have the staff and knowledge to make your party a success! Delivery currently deliver all of our kids jumper rentals and other party rentals to Bend, La Pine, Prineville, Redmond, Sisters, and other surrounding areas in Oregon. Thank you for choosing Midstate Jumpers! We look forward to delivering you with a great time!